In a food processor, combine tempeh, half of the cracker crumbs, dried spices, nutritional yeast, vegan cheese and liquid (rejuvelac or non-dairy milk) and combine until smooth. If the mixture appears too dry, add more liquid 1 Tbsp. at a time. 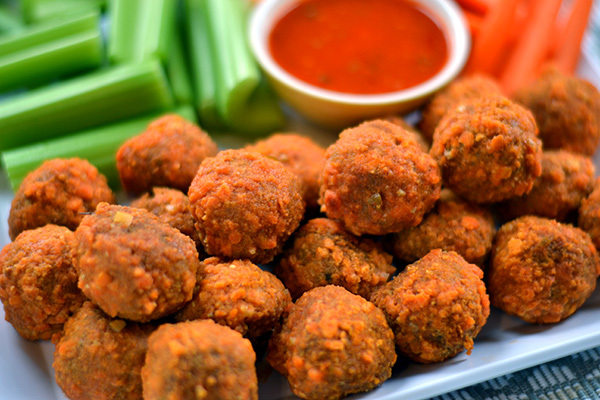 When the mixture is sticky (think meatball texture), dump it into a bowl, cover and refrigerate for 20-30 minutes. Preheat overn to 400 degrees F. Pour the remaining cracker crumbs in a shallow dish. In a separate bowl add 1/2 cup of non-dairy milk. 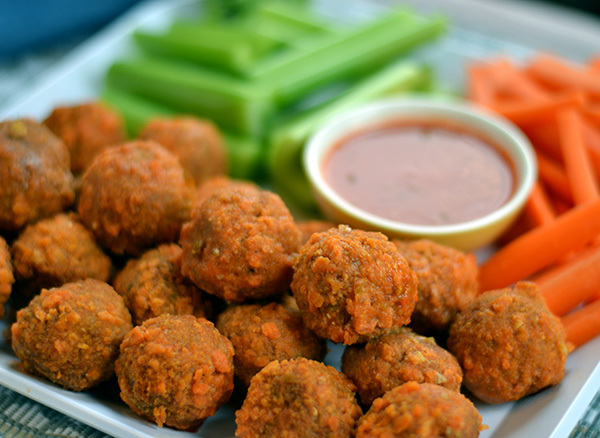 Assemble the balls by rolling the tempeh mixture into golf ball-size balls, dipping them in the non-dairy milk and rolling them in cracker crumbs. Place on a baking sheet lined with parchment paper and spray with non-stick spray (or drizzle with canola oil) and bake for 20-30 minutes, turning them over once halfway through. In a sauce pan over medium low heat, melt butter and saute garlic and jalapeño for 1-2 minutes. Remove pan from heat and add hot sauce, stirring to combine. 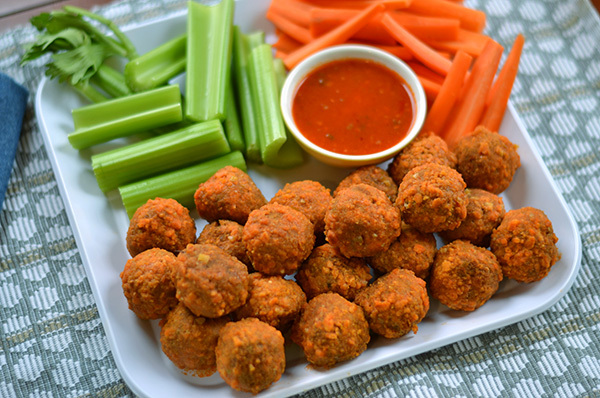 Once the balls are done baking and have cooled for 5-10 minutes, toss balls with 1/2 cup of the hot sauce, reserving the rest for serving on the side. For a milder version, serve all of the sauce on the side or lightly drizzle sauce over the balls. 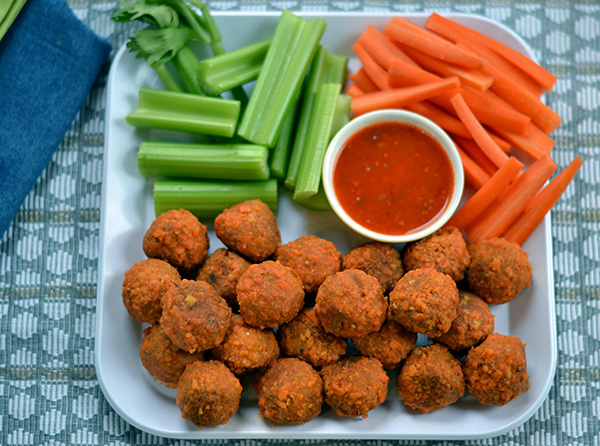 Serve immediately with carrot and celery sticks. *I suggest Ritz or a similar style cracker like Late July. I sleeve of Ritz is about 1 cup. Im Curious if I made crackers out if cocnut or almond flour if I can subsitute for the ritz? In a combo gluten free / vegan way thoughts? Fantastic recipe cant wait to try ! GF breadcrumbs should work just fine! Made these today without the crumb coating because lazy and with hot sauce on the side because kids. We all loved them (the youngest of us dipped them in ketchup). Happy to hear your family enjoyed them!